"It is all about the prep work", is the old adage we have all heard. For exterior painting this is absolutely true. Please keep in mind that unlike interior painting, doing work outside can have its limitations due to weather. If a problem occurs due to weather, we will return to the job site as soon as possible. 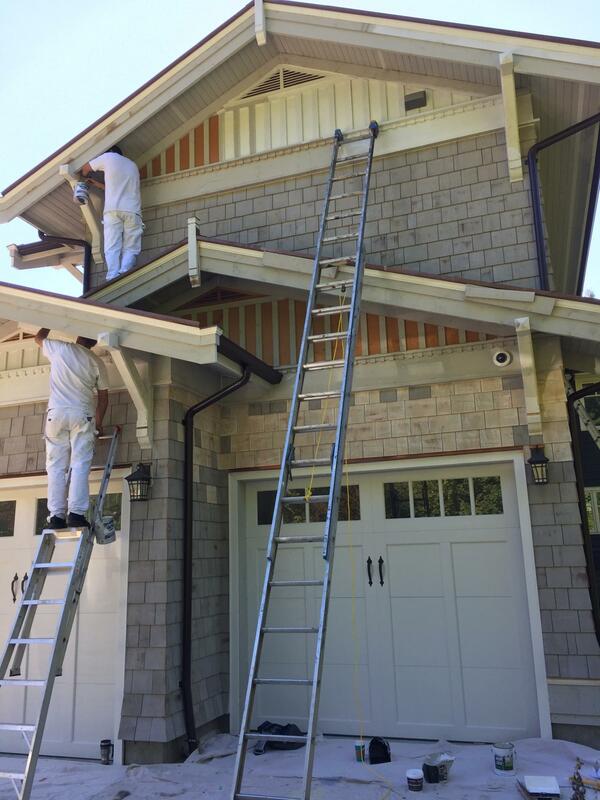 At Priority Painting we take care of all your exterior painting needs. When it comes to painting the exterior of your home we are experts in the field. We are committed to exceptional quality and we take pride in the fact that our clients repeatedly recommend us to their family, friends, and neighbours. 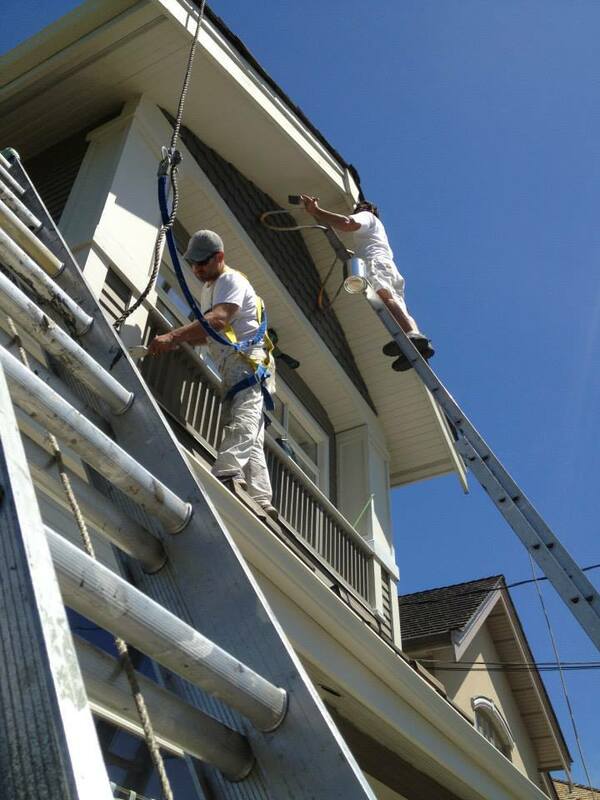 Over the years we have painted hundreds of homes throughout the Greater Vancouver area. From smaller homes to large estates, your satisfaction is our number one goal. In fact - we guarantee it. Our team of professional painters will arrive punctually each morning, and will stay until the workday is complete. Weather permitting, we will be back every day until your project is finished – no sporadic scheduling or unpredictable stops and starts. A surface must be clean for successful paint adhesion. The pressure wash begins with a thorough washing to remove all dirt and mildew. We must apply a cleansing treatment to any areas with mould and mildew to destroy spores and prevent future growth. Pressure washing can be a delicate operation. We use minimal pressure and a wide spray tip to ensure a proper cleaning without causing any damage. We mask and cover all areas such as windows, walkways, and light fixtures. Our crew will take every precaution to ensure that your property is protected. After all, it is not just a job site, it's your home. • Scraping and sanding any loose or peeling paint. • Glossy surfaces will be scuff-sanded to ensure proper adhesion. • Shallow blemishes or nail holes will be filled using an exterior spackling compound. • All mitre joints on wood trim will be caulked where previous caulking has failed. Primer is essentially the foundation that your paint is built on, allowing for secure adhesion, coverage of any repairs or blemishes, and durability. We use only high-quality products that we know from experience will perform as they need to, maximizing the value and benefits for your home. Once everything is clean, sealed, primed, and any mould neutralized, we can begin to apply the paint. We will brush, roll, and spray using an airless spray machine to apply the paint. We only use high quality paint from Cloverdale Paint, Benjamin Moore, or Sherwin Williams that meets or exceed the MPI (Master Painters Institue) standards. Our day is not considered complete until we have thoroughly cleaned and tidied the area where we worked. We move all equipment, ladders, and tools to a designated area. Every step and stage of the process will be directly overseen by an on-site foreman. When your project is complete, we will do a thorough walk-through with you to ensure that you are satisfied with the job.